That was fast. Just like that Square passed $3 million in transactions processed, on a Saturday no less, according to a Tweet an hour ago by CEO Jack Dorsey. The mobile payments startup is seeing an acceleration in transaction volume. It took about 10 months from its public launch for Square to reach $1 million a day in payments going through its mobile app. Getting to $2 million a day only took about two months. 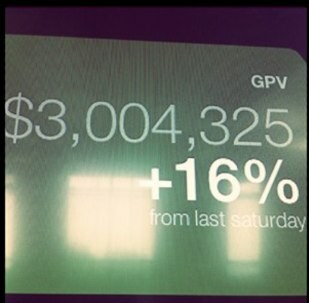 And now, less than a month later, it is passing $3 million. Visa just invested, transaction volume is picking up—things are looking good for Square. COO Keith Rabois will be at Disrupt NYC. We’ll be sure to ask him what’s driving the surge in Square payments.